Here is a different example regarding bifurcations and angles. They are telling us not to call the angle at B where C meets A as a bifurcation. Figure 134 is a tented arch. The ridge marked "A—A" in the sketch enters on one side of the impression and flows to the other with an acute rise in the center. Ridge C strikes into A at point B and should not be considered as a bifurcating ridge. The ridges marked "D—D" would form a tented arch if the rest of the pattern were absent. Disregarding all but A, B & C in Fig. 134, we are looking at a configuration that you have described as a probably 'well fed' bifurcation. Patti wrote: Here is a different example regarding bifurcations and angles. Patti, I am wondering: regarding what aspect of our discussion are your presenting this example? PS. 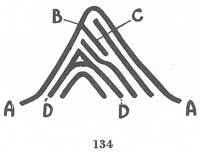 At point B we clearly see a continuing ridge (A-A) + an abutting ridge (C)... so there can be no doubt that all: point B can not be described as 'bifurcation'... because at point B the ridge A-A does not change it's direction. Yes, agreed no change in direction on the A-A side before and immediately after where C meets at B. But, according to the rules of a continuous ridge (and the rule that you applied in the Disney print to close a gap) was that if the ridge is continuous in direction they can be considered the same ridge. The slight curve on the corresponding ridge in Kiwi's print to A-A meeting C at point B is within the rules of a continuous ridge. In Kiwi's you can also follow A-C, but to do so, one sees a much more obvious curve than A-A. If you insist it's a bifurcation and the forks go in two directions, 1 direction would be the same as the mother ridge and the other would go in a new direction. If not, you are not describing a bifurcation. You are describing abutting ridges. My point if it seems lost, is that a bifurcation is not a triradius. It is used as an FBI "delta" (same as Penrose Triradial Point etal) only when it is 'open to the core'. At the place where 3 fields meet, there are only 2 kinds of triradii. Angles where they meet at a common central point and angles where they meet at the outer corners or angles of a triangle. The FBI rules describe locations where angles are found that we are to be concerned in our classifications. The only 'open to the core' angle that is found when you find a form of the triangle where the 3 outer angles touch is the one on the marginal side, or side away from the pattern area. This angle at the marginal side is the only 'bifurcation' illustrated by the FBI to be used as their delta focal point. That is why I think it is misleading to call it a bifurcation. Patti wrote: My point if it seems lost, is that a bifurcation is not a triradius. Patti, the issue 'open to the core' really only relates to a situation when "... there is a choice between two or more possible deltas". So your requirement (relating to the word only) can not be used as a general requirement for any bifurction to become a 'delta' (basically, that requirement will typically only to serve a requirement when there are multiple bifurcations that could serve as the location for the delta). "Once studied, however, the pattern presents no real difficulty. There are no ridges intervening between the delta, which is formed by a bifurcation, and the core." "Whenever the ridge traced bifurcates, the rule for tracing requires that the lower limb or branch proceeding from the bifurcation be followed. This is illustrated in 292." ...So, in the F.B.I. system any point that truely meets all requirements to be described in the scientific approach as a 'triradius'... can in the F.B.I. approach be described as a 'bifurcation'. Because otherwise, that would for sure mean that the F.B.I. has failed to describe the most common manifestation form of a 'delta' (= the 'triradius' in the scientific approach)... and I think it would basically be quite silly to make such a claim. You are mistaken about fig. 292. It is speaking of encountering bifurcations when tracing the type lines. They are saying here to move away from the pattern when tracing and you reach a bifurcation. It is not describing the fbi focal point delta as a bifurcation. In fig. 139 you are looking at 3 ridges meeting at the center type of triradius. A Star triradius as I would describe it. The FBI focal point delta is exactly the same location as Penrose etal. i.e. the middle of 3 ridges meeting at the center. Patti wrote: You are mistaken about fig. 292. It is speaking of encountering bifurcations when tracing the type lines. They are saying here to move away from the pattern when tracing and you reach a bifurcation. Patti, the comment that I have quoted can only relate to the upper radiant of the right 'triradius'... which does make the bifurcation (at the upper left side of the 'whorling ridges'). So, that right 'delta' is here clearly described as a 'bifurcation'... while it also have all necessary elements to be called a 'triradius' (in the scientific perspective). You do however, illustrate in these two examples from the FBI that they interchange bifurcation as a splitting ridge and bifurcation as meeting ridges as in fig. 139. In spite of rules about angles! In spite of that, they never show a bifurcation with ridges branching in the same directions as possible locations for the focal point fbi delta. Attempting to use a bifurcation as an all-purpose location for a triradial point can only be supported when using a bifurcation that qualifies as either the marginal angle of the triangular triradius, or the meeting point of 3 ridges as in fig 139. "Whenever the traced ridge traced bifurcates". It's not saying the bifurcated ridge is traced. <edit> and it's not saying the delta is a bifurcation - although I'm sure they would, because they are interchanging the angled formation of the triangular triradius with the term bifurcation. Ah yes ... you're right: the word 'bifurcation' does not relate to the right 'triradius' in figure 292. But figure 139 still does illustrates that any any true 'triradius' could very well be described as a bifurcation in the F.B.I. system - because a 'perfect triradus' (including 3 exact angles of 120) does not exist in reality: resulting in that there will always be angle smaller than the other two. This indirectly also relates to what Loesch described in her definition for a triradius a the phenomenon 'unsymmetrical triadii'. PS. 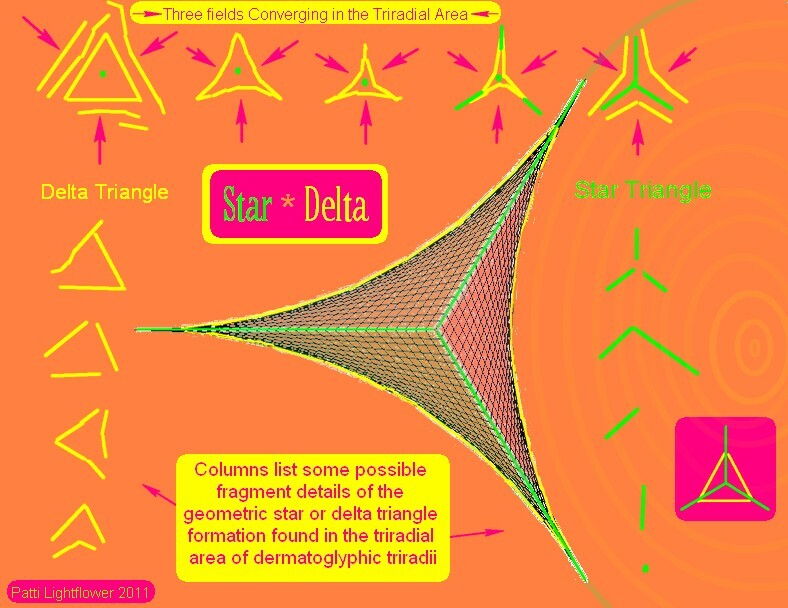 Regardin your additional comment: yes, I mentioned that earlier... in any example where one can observe a 'triangular triradius' (see examples 25, 26, 50, 51, 52, etc.) the F.B.I. always simply focusses on the bifurcations involved that create in the ridges the complete triangular shape. Patti, does your comment implicate that you now finally recognize as well my point? If you agree that the FBI interchanges a splitting bifurcation at times with one of the angles of the Penrose's F or G examples, then 'yes' I agree that the FBI has a multiple use of the term 'bifurcation'. I think this isn't helpful on their part, but only is an issue to those of us who mix the FBI's rules with the scientific communities' methods. I would imagine Cummins & Midlo would add a paragraph relating to that misuse of a term if they were alive today. 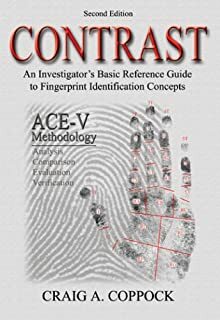 Using a bifurcation as the all-purpose fbi delta point does not always get the same results when using the scientific method. Both methods should always have the same results, or one of the methods is being incorrectly applied. "The triradius is formed when three fields of parallel lines meet and its centre has three radiant lines which lie approximately 120 degrees to one another (in practice, however, singularities in the lines of greatest curvature on a surface may produce unsymmetrical triradii so that the angles between the radiants may not be equal)." Voila... ...!!!! In Loesch's definition we see a characteristic that can directly be associated with a typical characteristic of how a 'fork'/'splitting' has always been defined - except of course... (1) while in a true 'fork'/'splitting' the two diverging ridges continue parallel... (3) and in a true 'triradius' the diverging ridges continue in a different direction (2) but in a true 'bifurcation' the diverging ridges continue in a different direction... making an angle between 90 and 120 degrees. And after saying this... I hope it makes sense that next to the words 'triradius' and 'triradial point'... the F.B.I. is also not using the words 'fork' and 'splitting'!!! Which implicates that the F.B.I. really is using the word 'bifurcation' as an ALTERNATIVE NAME for a group of words, including: the 'triradius', the 'fork' and the 'splitting'! I think there is agreement between all of us in what I've chosen from your post above. There is nothing new here. I have pointed out the FBI uses bifurcation for the marginal angle of the triangular triradius even though that location does not always fit the degree of separation as described for a bifurcation. Penrose, Schaumann & Alter and Cummins & Midlo relate to "near" equal angles of 120 degrees and Penrose tells us not less than 90 degrees. There was no argument among us here either. Loesch is not adding anything different in her description than has already been presented. (1) If you agree that the FBI interchanges a splitting bifurcation at times with one of the angles of the Penrose's F or G examples, then 'yes' I agree that the FBI has a multiple use of the term 'bifurcation'. (2) I think this isn't helpful on their part, but only is an issue to those of us who mix the FBI's rules with the scientific communities' methods. (3) I would imagine Cummins & Midlo would add a paragraph relating to that misuse of a term if they were alive today. (4) Using a bifurcation as the all-purpose fbi delta point does not always get the same results when using the scientific method. Both methods should always have the same results, or one of the methods is being incorrectly applied. Patti... ; sounds to me that you made at least some progress in recognizing that the F.B.I. really has only one single 'label' available that could be used for describing a 'triradius': the word 'bifurcation'. By the way, the implication of this point is that the F.B.I. has basically implicitely declared the word 'triradius' as ... outdated and completely irrelevant. And this is also confirmed by internet statistics - a few weeks ago I did some research on internet statistics in the 'Google Scholar', and I found that since the 1980's the word 'delta' became gradually much more popular in scientific publications related to fingerprints. And in the past few years the word triradius is only still quite often used in the perspective of the palmar triradii (especially regarding the 'axial triadius'). Ad 1) Sounds find with me. Ad 3) I think that Cummins & Midlo would actually have embraced the F.B.I. perspective, because it is really much more detailed. There is nothing 'misleading' (quoted from you words Patti) about the F.B.I. 's system. And the F.B.I. also does not 'misuse' (also quoted from your words) the word bifurcation.... especially since earlier today I have also identified how Loesch has started to describe explicitely that the idea of a perfect 'triradius' is basically only an imaginary concept - because in practice ridges do not develop straight, they always have a small 'curve' resulting in smaller or larger 'asymmetrical' shapes. 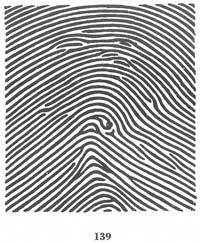 Ad 4) Well, all I can say is that in all 'complex' fingerprint examples that we have discussed so far I was able to find the same result (in terms of 'pattern type' & ridge count) with both methods - and after our lengthy discussions so far, Lynn was able to confirm my assessment for the Disney print and the two fingerprint examples from Kiwihands' hands. Well, Loesch basically only refers to the work of Penrose. But I am not sure about what Penrose has said about how ridges in a 'triradius' manifest IN PRACTICE. However, Loes does mention that in the work of C.A.B. Smith (1979) a 'cusp' was introduced as a third element next to the basic elements 'triradius' and 'loop'. 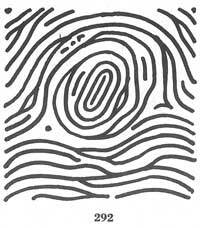 I recognize how Smith's idea of a 'cusp' could very well also relate to how a 'triradius' typically manifests in practice - because due to the nature of how how fingerprints develop (in terms of 'forces' acting pressure in the skin)... I can visualize that when studying the details of any triradius in practice, it will very likely nearly alwas display a characteristic that is typically also seen in a 'cusp'. So, regarding Loesch's comment about how a 'triradius' typically manifests in practice with an 'asymmetric' shape... I would not be surprized if that notification can not be traced back to passages in the work of Penrose. I do not agree that the word bifurcation is an exchangeable term for triradius. I think it is a mistake to use "bifurcation" when describing a triradius. I think only you have labeled a triradius a bifurcation. The triradius is 3 ridges. The delta or triradial point is a 'focal point' at the center of these 3 ridges. I don't think either of you have confirmed anything with the Disney prints other than none of the prints uploaded are of the quality to make absolute statements. I think it's also important to study how 3 curving fields meet in nature or geometry. Equal pressure would create a more equilateral triangular formation, uneven pressures would create a less equal sided formation. I don't see how the use of 'cusp' can be helpful in understanding a triradius that is formed by 3 ridges meeting (corners or centrally). The idea of 'cusp' would seem to be more related to an "S" shape in the whorl category. "J - Triradius: an intersection of seperate ridges often found in the delta areas. A triradius is similar in appearance to a bifurcation yet, with a greater angle between the seperate ridge intersections." "The triradius is 3 ridges. The delta or triradial point is a 'focal point' at the center of these 3 ridges." But regarding your earlier comments where you described the F.B.I. 's use of the word 'bifurcation' as 'misleading' + 'misusing'... Coppock's definition of a 'triradius' actually explicitely confirms that my conclusions is correct - because I am certainly not the first person who recognized that the F.B.I. 's multi-concept of a 'bifurcation' includes the typical variation shapes of how a 'triradius' typically manifests in practice. So Patti, please be aware that if you 'reject' the green words above... then you do not only disagree with me, but then you are implicitely also rejecting some significant parts of the F.B.I. book & Coppock's book. I hope you will give it another attempt to put everything in perspective. Lynn carefully explained to you that this comparison was only a visual, looks like, comparison. They are not describing a triradius as a bifurcation. A " Y " shape looks similar to a shape with 3 ridges meeting at the center, especially if it is not symmetrical. A " Y " shape looks similar to a shape 3 with ridges meeting at the center, especially if it is not symmetrical. Patti, are you suggesting that Lynn made such a comment after I earlier introduced the quote from Coppock's book? I think it's very important that they have said "separate ridges". This again confirms the 3 different fields. One ridge from each field. The triradius that is formed by 3 ridges meeting at the center is only "similar in appearance" to a bifurcation. This cannot be said about the triradius that is formed by the 3 ridges meeting at the outer corners/angles. Therefore, this quote is not a complete description of all triradii. Only those that comply with Penrose fig. F. - three ridges meeting at the center would comply, and we know that's too limiting a description for the triradii we already have encountered. Yes. Lynn pointed out to you that they were only saying it 'looks like'. "J. Triradius (An intersection of seperate ridges often found in the delta areas. A triradius is similar in appearance to a bifurcation yet, with a greater angle between the seperate ridge intersections.)" You seem to have completely misinterpreted this Martijn. He's just saying that a triraidus LOOKS SIMILAR TO a bifurcation, but with wider angles. That's as far as the similarity goes. Earlier on the same page he states that a bifurcation is a dividing ridge. Here he says a triradius is an intersection of ridges. An intersection is where lines meet or cross. Elsewhere a bifurcation is variously described as a forking ridge, a splitting ridge.A bifurcation is not the same thing as a triradius.